Habit: Annual; hairs +- appressed, +- curved. Stem: prostrate or ascending, 2--30 cm. Leaf: 1--4 cm; leaflets 7--15, 2--8 mm, +- oblong, tips generally notched. Inflorescence: flowers 1--6, +- spreading. Flower: petals +- white, banner 4.7--7 mm, recurved +- 45°, keel 4.3--5.8 mm. Fruit: 12--30 mm, 2--3 mm wide, gently curved, +- 3-sided, pale brown, thinly walled but not bladdery, early-deciduous; chambers 2. Ecology: Sandy or gravelly areas; Elevation: 200--2100 m. Bioregional Distribution: SNE, DMoj, w DSon; Distribution Outside California: Nevada. Flowering Time: Apr--May Note: Often confused, growing with Astragalus nuttallianus (fruit persistent, in age dark brown or +- black, curved most strongly near base; at least upper leaflets acute). 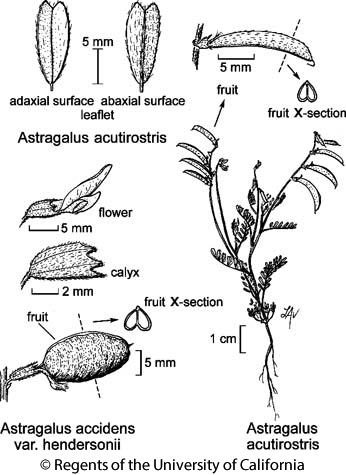 Citation for this treatment: Martin F. Wojciechowski & Richard Spellenberg 2012, Astragalus acutirostris, in Jepson Flora Project (eds.) Jepson eFlora, http://ucjeps.berkeley.edu/eflora/eflora_display.php?tid=14661, accessed on April 19, 2019. SNE, DMoj, w DSon; Markers link to CCH specimen records. Yellow markers indicate records that may provide evidence for eFlora range revision or may have georeferencing or identification issues. Purple markers indicate specimens collected from a garden, greenhouse, or other non-wild location.